as seen on My Royal Enfields. My statement that Royal Enfield motorcycles rarely show up in photographs of motorcycle stunts performed outside India was immediately tested by the self-correcting mechanism of the Internet. Jorge Pullin points out his excellent item on British daredevil Tornado Smith, who chose a Royal Enfield Model RE for his "Loop of Death" stunt. "Check out the British stunt rider Tornado Smith at The Selvedge Yard website as well as items on contemporaries." The Selvedge Yard site Mark points to is fantastic, with many vintage photos of Tornado Smith, riding lions and photos of lovely lady riders. Check it out. Tornado Smith gives Maureen Swift, 16, a ride. My comment had been that the lion shown riding the wall seemed to be enjoying the ride. 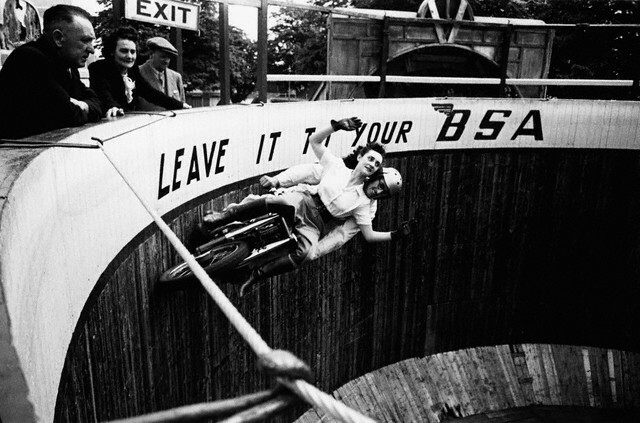 But check out the calm expressions on the faces of those women riders. Almost blissful. There is some magic in speed and balance that soothes the soul. Else, why would we do it? Meanwhile, here is a video I spotted on YouTube entitled "Wall of Death on Royal Enfield," posted just two months ago by "Tazza12," who gives his location as the United Kingdom. I can't tell from the video what kind of Royal Enfield it is. Can you? UPDATE: Tazza messaged some information. "I filmed this back in September this year. It was at the Ace Cafe Brighton Burn Up event. I have no idea what model the bike is. Hope this helps. Thanks for watching." Don't know about lions, but in the US riding with a dog will get you in trouble!